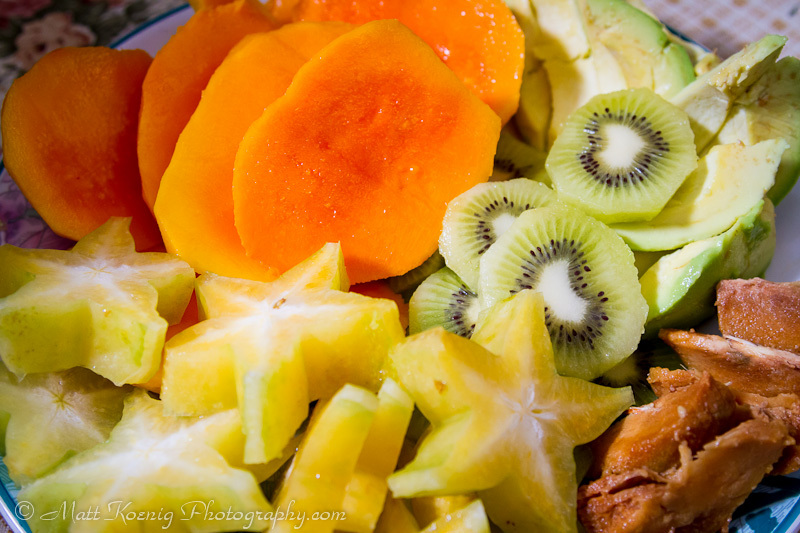 Our breakfast this morning; mango, star fruit, kiwi and sawo. We’ve been enjoying our initial time here in Indonesia. I don’t know whether it’s the difference in time zone or whether we are just excited to start each day but we’ve been getting up much earlier than we normally would. For example this morning we woke up around 5:30AM which I don’t think I’ve ever seen the boys do. So since we’ve been getting up so early we wanted to eat a breakfast that was healthy and would provide lots of energy for the day. Here in Indonesia it’s easy to find a wide variety of fruit and vegetables that are generally inexpensive. Everything from mango, star fruit, papaya, kiwi, orange, banana and many other fruits are easily bought fresh right on the street outside our house each and every morning. 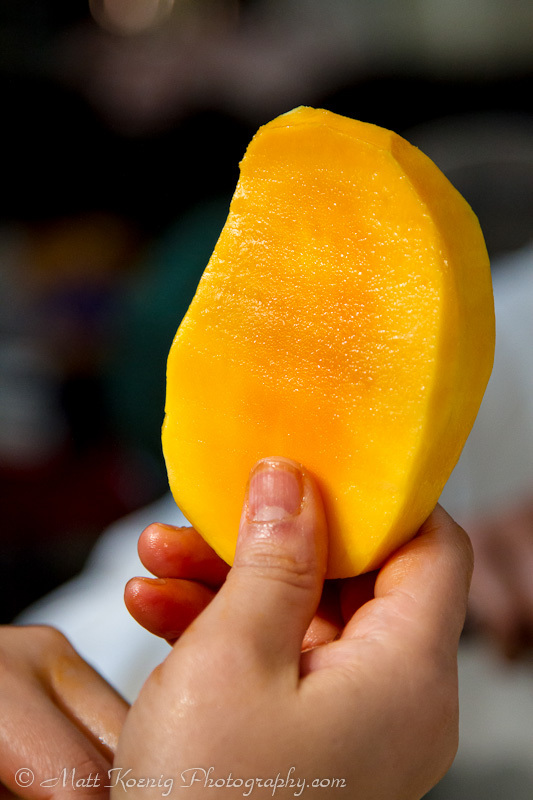 Colorful, sweet and tasty mango. We’ve been enjoying these every morning for breakfast. This morning we indulged in fresh mango, star fruit, kiwi and an interesting fruit called sawo. The mango here are the sweetest and juiciest I have ever eaten. I could seriously sit down and eat a dozen of them. There are many different varieties of mango here. One of my favorites is gincu (Alphonso). The skin color is reddish to yellowish and the flesh is a deep orange color. It’s ultra sweet and tasty and practically melts in your mouth like butter. I think most of us are fairly aware of the benefits of eating fresh fruits and vegetables as a major component of our diet. What I’ve found interesting is that we’ve been eating many more fruit and vegetables during our sabbatical here in Indonesia than we ever did back home in the US, and the kids are eating a wider variety of foods. I’ve been trying to figure out why that might be because it’s not like we don’t have fruits and vegetables in the US. I think it’s a combination of a few things. First I think a lot has to do with availability. Here we can literally walk out the door and buy fresh produce. In the US we would need to drive to the store. In fact if we really wanted to there are community mango trees growing 100 feet down the street where we can pick fresh mango off the tree. So a big part is easy availability. Secondly, compared to Oregon there is a much greater variety of fruits and vegetables than is available in our local supermarket in the US. There are times of the year, namely Summer, where the variety increases locally but since Indonesia is a tropical country the vast variety is available all year long. Everything from mango, papaya, pineapple, star fruit and things I hadn’t even heard of are readily available virtually all the time. Of course there are seasons for things when they are at their best or peak but in general you can get what you want at any time. Finally, fruit and vegetables here just taste better. It’s my experience that in the US (at least where we live) that much of the produce you find in the supermarket is picked well before it is ripe. That’s not always the case but in general it’s been my experience. This is mainly due to needing to transport the produce from vast distances. But here in Indonesia the produce is local and picked at it’s peak so it’s much more tasty and probably nutritious as well. Since we started our sabbatical and have been eating better and healthier we’ve had more energy an felt better. Maybe a lot of that is losing the stress of a cubicle driven job but I like to think a major player in our good health is that we are eating more nutritious options that taste better. I love that we are able to get all of the “exotic” fruit inexpensively that would cost us a small fortune back home. I will admit that I do miss our local farm produce for things like apples, squash and other hearty more cold weather fruits and vegetables. You can’t beat local produce and we try and support the local farms as much as we can. Warren & Betsy Talbot of Married with Luggage just ran a great post on healthy eating and travel. Definitely check it out if you get a chance. It’s the wet season here in Indonesia and we’ve had our fair share of thunderstorms and torrential downpours. Coming up is a video we took of what the streets look like after an hour of rain. We have been loving the availability of fruit and vegetables here in Thailand as well. In the summer months at home we eat lots of fresh fruits and veggies but in the winter not so much! What I have been loving is all of the tropical fruit. We are certainly getting our fill because we can’t afford this stuff in Canada! Hey Amy! I’m loving that your family is having so many adventures. We finally started ours. It’s the same with the tropical fruit in the US. We can’t afford it either. I can get a whole bag of mangoes here fro the price of 1 in the US and it’s many times better as it’s actually ripe when you buy it. BTW…we too are traveling with picky eaters. Been trying to get them to try more and encourage them to have a more rounded experience here. When we were in the Philippines one of the best things was eating fresh mango and papaya every day. I am a mango addict, so I was in heaven! I also got addicted to Nescafe Three-In-One, less healthy but a great pick me up! Do they have that in Indonesia? p.s. have you sampled the local beer yet? I’m not sure whether they have the Nescafe but I will take a look in the stores. I have not sampled the local beer as of yet although I have drank a Bintang or two last visit here. The mangoes here are definitely the best and I love that they are so available. Just walk outside and someone is usually within a block selling fresh fruit.